Home > News, Blog & Events > What makes me the best scientist I can be? What makes me the best scientist I can be? 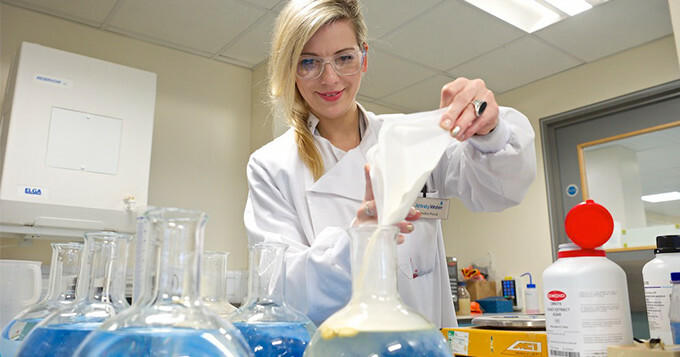 For World Water Week we speak to water scientist Sandra, who works at one of our Employer Champions and CPD Approved Employers, Affinity Water. I am offered many different kinds of training opportunities at Affinity Water which are usually associated with water or water microbiology and they all count towards my continuing professional development (CPD). One day I would be taking part in water treatment training and the next I would be doing first aid training. Some of the training activities have even given me the opportunity to shadow colleagues in another part of the business such as the treatment plant where I spent the day with a sampler, which allows me to find out where the water we’re testing in the lab comes from. My curiosity means I always want to know more. Whenever I ask my manager, “Can I do this?” “Can I go there?” “Can I see that?” The answer is always, “Yes, I will arrange it.” Which is amazing. My manager, Vydeki, encouraged me to apply for professional registration as it was encouraged as part of the CPD programme at work. At first I felt like I was not ready. I felt like I haven’t done enough yet but then Vydeki spent some time helping me to fill in my application and then I thought, “Actually, I can do this.” I don’t think I would have had the confidence to apply for registration if my manager hadn’t approach me. Because I’m always doubting: I need another year, and another year, and another year of experience. Sometimes, you don’t know what you know. Vydeki stayed for all the face-to-face assessments as well. It was a big support. I actually enjoyed the interviews as well. Surprisingly during my interview I learnt quite a few interesting facts. I was concerned I might lack knowledge in certain areas but I realised it doesn’t matter as long as you are willing to learn and apply yourself. Ironically during my interview I was the one asking questions to my interviewers. This is what I believe makes you a scientist – not being afraid to ask questions. Being a member of a professional body such as the Royal Society of Biology also helps with my CPD. It was nice that it was my manager who told me about the different societies I could join, and she told me about the importance of being in one. I had no idea about them until I came to Affinity Water. My previous job was a little bit different; there was no self-development. So when I came to Affinity Water I was surprised that the company actually really wants us scientists to be trained and engaged in different projects. There are opportunities to get actively involved with your professional body. For example, after I was accepted as a Registered Scientist, my colleagues and I were invited to the House of Commons to celebrate the achievements of the Royal Society of Biology and I received my Registered Scientist certificate. Being actively involved in your professional body’s events is an amazing experience. When you are recognised and feel engaged you want to do more. You are inspired; you feel that you are a part of something great. When you feel that your company invests in your own development, you feel more engaged with the company. My colleagues and I are always looking to improve ourselves and because of that the company can gain a lot. I also feel appreciated as well. Whenever I’ve got an idea, the managers will always say, “Yes ok, why not.” It’s amazing. So that’s why we don’t really want to leave. That’s why people stay here. That’s what helps me become the best scientist I can be. Find out more about the Science Council’s professional registration and our work with employers.